When I first started blogging, I finished everything I picked up. Whether it took me a day or a week to slog through something I hated, I finished. I viewed myself as a failure if I didn’t finish. Guess what? I’m no longer afraid to slap DNF @ 25% (because I always give it until at least 25% before setting it down) on a book. It’s a classic ‘it’s not you, it’s me situation’—there are books out there that other people rave about and I just can’t get into. And visa versa. I’ve liked plenty of low-rated books. Here’s the deal. If you were to read every book logged by The Library of Congress, it would take you about 60,000 years to finish them all. Let’s scale it back for moment. If you were to read every book released in the span of one week (roughly 2,800 books), it would take you about five years and four months to read them. Damn! I’m constantly adding to my TBR pile, and there is about 511 books on my Goodreads list. 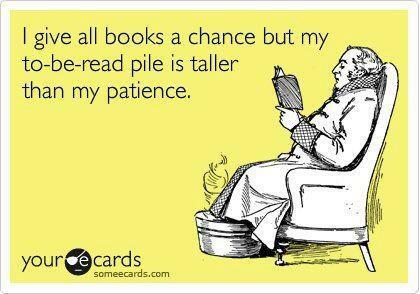 That alone would take me about five years to complete, if I were to read at my current pace. That doesn’t account for the number of new books I add to my list as they’re released or I discover them. My point? Ain’t nobody got time for books they don’t like! Do you guys DNF? Or do you soldier on?